We gave this article a little shake up and removed two older models in the Fender MA-1 and the Jackson JS 1X Dinky Minion. However, in their place, we reviewed two very popular guitars for smaller-handed players – a handsome acoustic from Oscar Schmidt, the OG1FYS, and the timeless Fender Mustang. How would you define your perfect guitar? On one hand your personal preferences will heavily influence what you go for – you may prefer certain shapes, styles, genres and sounds. For example, a D’Angelico EX-63 Archtop is a very different guitar to RainSong’s H-WS1000N2! But then there’s the physical factor. Guitar players come in all different shapes and sizes – some are big, some are small, and your height, hands, arms, back and shoulder power will definitely determine your ideal guitar. In this article we’re focusing on demonstrating some of the best guitars for small hands. There’s a variety of factors to consider here, but typically those users with smaller hands tend to be children, teens or ladies (however if you are after a guitar for your child, check out our article on the top rated guitars for kids. With this article our target is to help you find a smaller six-string acoustic that delivers the same quality as a full-size model. Our quest yielded a set of eight champions, all of which patiently await your consideration in the rundown below. Apart from the list, make sure to also check out a few guides we have in store. Here goes! We’ll kick things of with the electric bunch. When it comes to the best electric guitars, neck thickness and scale length is an important factor for small-hand players to adapt themselves, but smaller body size can also help. Check out the four champs we singled out and head over to the amplifiers reviews section after that. Up next, we’ll delve into the world of best acoustic guitars for smaller hands with another set of four champions. When discussing the given matter in the best acoustic guitars domain, the body size becomes of greater importance due to the instrument’s very nature and the fact that bodies are chunkier on acoustics than on electric models. Anyhow, check out our picks in the rundown below! Sporting a solid mahogany dreadnought body. Superb playability and the best sound on this list. Yamaha offers a sized version of what is considered their champion. If budget is a concern, the unique OG1 is the solution. Genuine Fender that’s great for everything from funk to punk. Ideal combo of cheap pricing and good sound quality. An affordable Jaguar – always great for smaller hands! Good for metal players with small hands. If you’re a fan of the crisp, mellow sound present on a variety of classic country efforts, Taylor Guitars are always a valid pick for you. For this specific occasion, we singled out the 3/4-size six-string known as the BT2 Baby Taylor. Sporting a solid mahogany dreadnought body armed with layered sapele back and sides, this guitar stands out with an exceptionally full and well-rounded sound by 3/4 criteria. The basses are strong, which is of utmost importance for any acoustic guitar, and the rest of the frequencies are present in the mix as well, with punchy middles and bright and cutting trebles. The Little Martin LX1 is the smallest guitar the legendary American brand produce, which makes it perfect for players with smaller hands. As with any Martin model, it demonstrates timeless looks and a solid build that any guitarist would be pleased to show off – as we showcase in the full review! With a similar size and price to Taylor’s BT2, the top is crafted from solid Sitka spruce, while the back and sides feature a High Pressure Laminate mahogany. Incorporating their eco-friendly ethos, there’s a rust birch laminate neck and a 20-fret Richlite fretboard, that all plays well regardless of the size of your hands. The tone is lovely and bright, but well-balanced, and – like the BT2 – offers good projection for the petite size. Take Yamaha’s best-selling APX500II and make it smaller – you have yourself a APXT2! 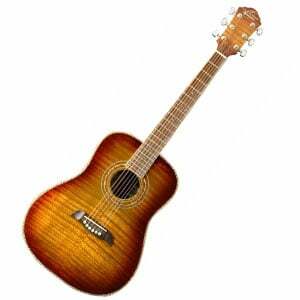 This cool electro-acoustic features a single-cutaway thinline body with a compact 3/4 scale. 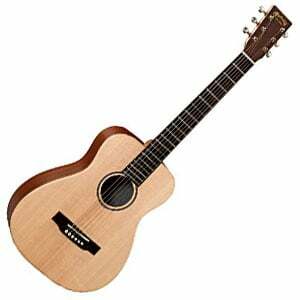 There’s a laminated spruce top with dark meranti back and sides, finished in a choice of three colors. The guitar sports a smooth nato neck that’s very comfortable for smaller hands, along with a rosewood fretboard and 21 frets. The tuners are decent and it comes with a padded gig bag, which also makes it a good choice for a travel guitar. As we mention in the full review of the Yamaha APXT2, it comes loaded with a simple but user-friendly ART-based preamp and System 68 contact pickup, featuring volume and tone controls, and a built-in tuner. The compact OG1FYS from the respected Washburn subsidiary Oscar Schmidt is one of our favorite acoustic guitars for players with small hands. In addition to offering an easily manageable 3/4-scale size with a comfortable mahogany neck, it also happens to be one of the best-looking acoustics we have featured, with a range of cool color choices – including red, blue, black and natural. For a small and affordable guitar, this Chinese-made model offers a surprisingly good build, pleasing tone and reliable hardware, including a set of chrome sealed tuners and a rosewood bridge. This all adds up to deliver excellent value. As always, there’s more on the Oscar Schmidt OG1FYS in the main review. We begin the electric guitar portion of this chart with a genuine Fender Mustang, known for its short scale and easy playability for those with smaller hands. This model – part of the brand’s Offset Series – features a lightweight alder body with the classic Mustang aesthetics. There’s a smooth satin-finished maple neck with a 24” scale length, making it a fun instrument to play. Sound-wise it is decent, with the stock Fender single-coils delivering enough punch and clarity, making it suitable for everything from funk to punk. Whether you’re a big Nirvana fan or just enjoy a reliable and versatile Fender, this really is a solid choice. Be sure to read more on the Fender Mustang in our complete breakdown. Fender Stratocaster is a guitar many people dream of, and if your hands are too small to wield a big-boy Strat, then a Strat Mini from Squier just might be your ideal fit. We are looking at a copy of the company’s Bullet guitar, a faithful replica of the iconic six-string with a super affordable price tag. The axe utilizes a standard line of three single-coil pickups, as well as a classic five-way switch reeling in a variety of sonic vibes, going from bright and light tone for blues and jazz to a more bass-driven, gain-saturated rock and metal tone. 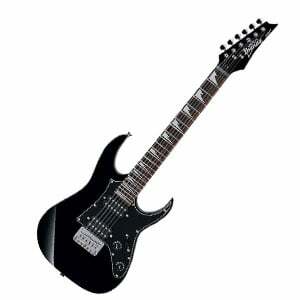 The guitar’s body is quite sturdy and specifically crafted to fit the needs of players with smaller hands. In general, this instrument does a fine job to showcase Fender’s ability to craft an ideal match of cheap pricing and good sound quality. Fender’s oddly-shaped Jaguar is a famously brilliant electric guitar for small-handed players, with its typically smaller scale length. And this Squier Jaguar is a more affordable way of getting your small hands on a real Jag! With the classic offset Jaguar body shape, it features a 24” scale length with a very playable maple neck, rosewood fretboard, and 22 medium jumbo frets. 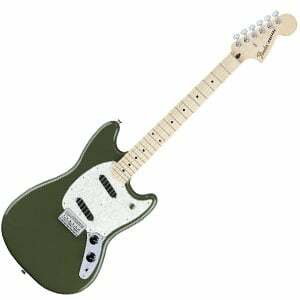 The body itself is made from solid basswood and finished in a range of cool vintage color choices – including Surf Green and a two-color sunburst. As we talk about further in the full Squier Jaguar review, its loaded with solid electronics. There’s two single-coil pickups with duel circuit controls, for a guitar with huge versatility and lovely vintage tone. This guitar has a 3/4-size mahogany body mixed up with a 22”-scale maple neck with classic rosewood fingerboard, a set of 24 frets and signature sharp Ibanez inlays. And speaking of signature Ibanez features, the guitar of course utilizes the company’s distinctive super slim and playable neck. That combined with a double humbucker duo and extended 24 frets make this fella perfect for shred solos and metal music in general. The mahogany body reels in a rather rich sound driven by a prominent low end with dose of punchy middles and clear and bright trebles to round up the sonic output. Further on up the road, that humbucker combo offers a beefy and loud sound similar to the aforementioned Dinky guitar. We’re looking at everything a beginner metal guitarist needs, only in a smaller package. Good stuff! When it comes to fingerboards, it is ideal for you to get one with a string length between 22 inches and 24.6 inches. This way, it will be significantly easier for you to grab all the chords properly, as the process will require less power and less finger length. Additionally, these types of six-strings also tend to have a slimmer neck, which is one of the requirements we have listed. As for the smaller bodies, this factor particularly applies to acoustic models. As explained, acoustic guitars have bulkier bodies by their very nature, making them more difficult to smaller players to use. 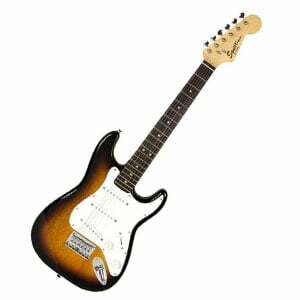 With a smaller, or just slimmer body, you will be able to grab a hold of the guitar with more easy and play the instrument without a hassle. As for the slim neck, this factor is essentially an extension of the shorter fingerboard requirement. Slimmer necks allow you to easily grab them, which is great for smaller hands. Slim guitar necks in general are great for fast playing and shred guitarists, but that factor equally applies for players with smaller hands who simply want to play the good ole chords and chops. When it comes to the strings, the first option is to get thinner strings with a smaller gauge. They are easier to press and easier to play in general. Additionally, if you’re an acoustic guitar player, replacing your instrument’s steel strings with nylon ones will greatly improve the playability factor. Note, however, that each of these factors has an impact on the guitar’s very sound. Smaller bodies are less resonant, slim necks produce a less chunky sonic attack, light strings have a completely different sound to heavy-gauge models, and nylon strings are a whole different world to steel strings. So test ’em all out and see what fits your overall needs the best. Just because you were born with a pack of shorter fingers or smaller hands doesn’t mean by any stretch of imagination that you can’t be a good guitar player. Never use this as an excuse for not being able to play the instrument, and always keep in mind that developing your technique and musicality is key, and not finger length. There’s several factors to keep in mind, but you should know right from the get-go that you’ll need to work on your stretching more than most players out there. These are actually not difficult exercises, and most of them are super easy to memorize, although they do require constant repetition that can become tedious. Anyhow, the most important point is to be relaxed at all points, and NEVER push your hands beyond the threshold of pain. You should start the exercises on higher positions on the guitar’s fingerboard, and proceed to lower positions as you advance. Here’s a neat video lesson on how to improve your finger stretching abilities on guitar. Make your pinky strong. If you have trouble to stretch your fingers due to their length, make sure that your naturally weaker pinky finger is strong. Play on higher frets, they’re easier to press. Use Drop-D tuning. It’s easier to produce heavy chugs and rock power chords with this tuning. Incorporate tapping to your style. It will allow you to reach several tonal registries. Finally, the crucial thing. Everything else is useless without this: Practice, practice, practice! And this marks the final stop of our journey, ladies and gents! We hope you enjoyed the ride and learned something new about small-scale guitars and six-string that fit smaller hands, and maybe even found your perfect match. Now it just comes down to the matter of jotting down your personal needs and preferences in order to find your ideal fit and make that purchase as early as today. Once you are done, all that is left is the never-ending quest of learning how to play guitar! 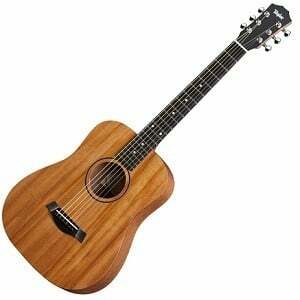 We’ve covered a lot of ground with this article, delving deep both into the realms of acoustic and electric guitar, and you can rest assured that each of the listed items is worthy of the title of the best guitar for small hands within its respective price range. Finally, make sure to subscribe to our newsletter and stay in touch with the site to keep track of the best guitar deals on the web. Rock steady, roll easy! i am 66 yrs old and had my left hand crushed when I was 25. I gave up guitar but now have the fevor bad. so, I am looking for a small electric beginner model. Thank you for your article. This was written for me. Had decided on the mini strat…..but GOD, is that SG beautiful, just in case I have to play “Mary Had a Little Lamb” and quit again and just look at it. Thank you again. I won’t quit this time. My hand is much better now. I’m so thrilled for you, Gary! I’m picking up the guitar for the first time since childhood, but without a serious injury in my way so I have no excuse at age 55! I actually think I have an advantage as a leftie since I’m playing a standard-strung guitar. I think my fretting dexterity will be a little better. It’s July now — you’d better have a few months’ practice under your belt! I have played guitar for over 60 years and taught it for 45 years. I have small short fingers and that is no excuse to not play well. I adapt a lot of arrangements to fit me and it works. Find me on youtube under 511mrpaul. Keep practicing whenever you have the time. Thank you, Thank you. I tried acoustic once and gave up instantly because I was too tiny to reach and chords, and it just ended up looking like a comedy routine. So I’ve been chilling comfortably with my uke for the past decade. Now my boyfriend has started teaching me and I’m so glad there are actually guitars out there for tiny people like me. This article was not only extremely helpful in what guitar to get, but also in how I can make it easier and better to play. Which one did u buy? Great instructions. My is short fat fingers. Middle finger is 3″ First finger 2.5″ third 2 3/4 baby finger is 2 1/4″.They call me sausage fingers LOL.. Seriously though it’s super hard to stretch like that but more so not having my chubby tips touch the string next to it. Would appreciate any tips. This 72 yr old is trying for his first time an instrument.